Keeping your kids sun-protected becomes child's play with SUN KIDS, the first Lancaster sun-protection range for children aged 3 and over. The water-resistant formulas go on fast and dry quickly, making life easier for moms. As children's skin is particularly sensitive to sun rays, sun exposure in both childhood and adult life represents the main environmental risk determinant for cutaneous melanoma. Pediatricians reinforce the sun exposure message with advice that includes avoiding sunburn and sun tanning, wearing clothes and hats with brims and applying sunscreen. Over exposure to the sun may also contribute to dehydration and sun stroke. On the positive side, reasonable and secured exposure to the sun, with the appropriate sun protection, helps the body synthesize Vitamin D which is essential for normal growth and bone development. SPF 50 mist for body, can be applied even onto wet skin, without leaving traces after spreading. 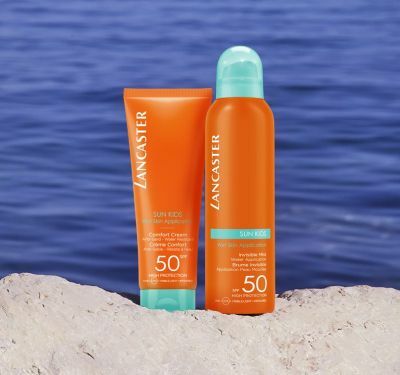 Both have highly water resistant, anti-sand formulae and provide a delicate scent specifically chosen for children. Beyond UVB & UVA rays, VISIBLE LIGHT & INFRARED rays represent around 90% of sunlight and may cause skin & DNA damage. 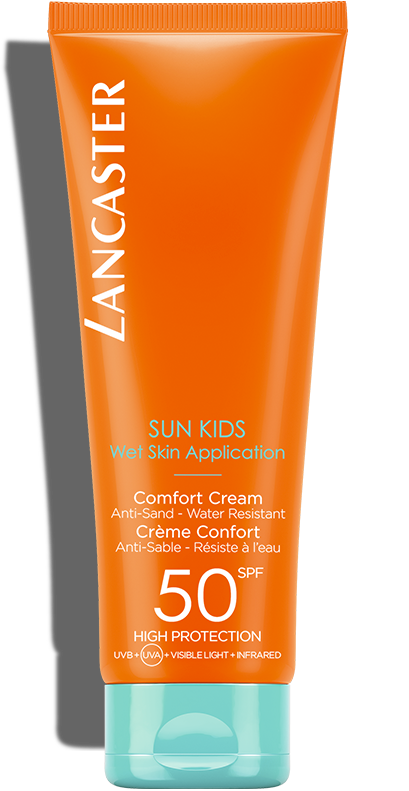 Lancaster SUN FOR KIDS carries breakthrough Full Light Technology that protects the skin from all 4 sun rays UVB + UVA + VISIBLE LIGHT + INFRARED for the most complete Lancaster protection and a patented Antioxidant Complex* to preserve the skin and its DNA from the negative effects of sun rays. Be responsible adults by following these sun protection application tips for kids to avoid sunburn and long-term, sun-related skin damage. - Apply generously to face and body before sun exposure. - Spread with hands after spraying. - Re-apply often. Re-apply after swimming. Re-apply after towelling. - Avoid direct sun exposure for babies and young children. - Keep kids out of the sun in the hottest hours, between 12pm and 4pm. Look for shade.